If you’ve spent any time in the tech world, you’re probably familiar with the term “Minimum Viable Product”. The idea is that when you’re building something, it’s better to start with the most basic version possible, so that you can see if the idea even works. 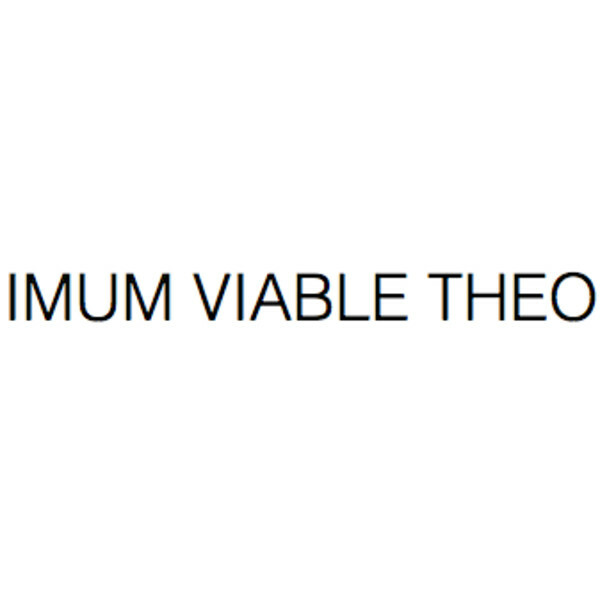 Lately I’ve been thinking about a minimum viable theology. What if, instead of jumping feet-first into a religion, complete with an intricate culture and thought-system, you could start with something basic, and work your way up? This isn’t unprecedented. For Christians, this is exactly the function of the Bible — to carry you through from basic ideas, all the way to the complete picture. The Biblical story itself is about a people making this journey over many generations, each generation gaining a little more insight and truth. It’s also how Christianity was first presented to the Greek world. In Acts 17, Paul stands in front of Athens and makes a remarkable speech, in which he quotes only Greek philosophers. Rather than citing verses from his own scriptures, Paul affirms and builds on things they already know. So if we wanted to figure out a minimum viable theology, where would we start? I think we’d start with this: Good wins. When I was young, I stumbled across an idea in a book I was reading. The idea was this: good eventually wins. When I read that, it shook me to my core. Not because it changed my beliefs or my thinking, but because this was the first moment that I was aware of this idea as an idea — as a standalone concept that could be examined and evaluated, affirmed or denied. In that moment, I knew that I believed it — that, in fact, it was an idea I would never be able to escape. Unlike everything else I believed, this was unnassailable and unshakeable. It simply was, and I would have to build my life around the fact that I believed it. In an important sense, everything else I think proceeds from that. Before discussing it further, let me clarify a few things. Saying that good eventually wins doesn’t mean that good is always winning, or that good is always on top, or that every winner is good. Quite the contrary. What it means is that even if vast evils are committed, and evil forces dominate—they will eventually be overturned. Over the long run, evil empires fall. Over the long run, good emerges triumphant. Over the long run, there is progress. Good is that which supports others. Evil is that which destroys others. When looked at in that way, something should become clear. We all want goodness to spread. It’s always in our own best interest for other people to be good. Consider a farmer who grows food to feed himself, and shares the surplus with his neighbors. He is behaving in a good way, and he wants his neighbors to be good as well. Now consider a thief who steals food from the farmer. He feeds himself by undermining other people’s ability to eat. He is behaving in an evil way—but he doesn’t want other people to be evil. Rather, he hopes that everyone else continues to be good. A society of thieves would be a miserable place for him to be. This is the deep paradox at the heart of evil. Evil can only exist by virtue of good. Good does not need evil, but evil absolutely needs good. This means that good has potentially infinite reach, while evil is fundamentally self-limiting. This becomes clearer when our thief forms a gang with some other thieves. There’s an old saying that there is honor among thieves, and this is true. A gang of thieves must be built on trust, in order to work together and accomplish their heists. But this trust is in direct contradiction to what they spend their time doing: betraying the trust of others. They must attempt to maintain very different realities inside and outside of the group. They must be good within the gang, in order to be evil outside of it. This is a very difficult dynamic. How can you build trust and cooperation and goodness within a group, while acting with dishonesty and evil outside of it? Contrast this with a group of farmers who get together to form a co-op, built on mutual trust. Each of them is already behaving in a good and trustworthy way towards each other. Their actions in the co-op simply amplify that goodness and trust, and their behavior towards the outside world takes that trustworthiness even farther. The internal reality of the group is completely consistent with the external reality of the group. The goodness within the group reinforces the goodness outside of it. The contrast becomes even more pronounced when we consider this from the perspective of memes. As a culture, we now think of a “meme” as a bit of text superimposed on a funny picture that get spread around the internet. But the original idea was broader: a meme is any idea that can get passed from person to person. Good behavior and evil behavior are both memes. Both are ideas that can spread from person to person, as we unconsciously imitate others. We can see someone act in a good way, and be influenced to act in a good way as well. Or we can see someone act in an evil way, and be influenced to become evil ourselves. But no one wants to live in an evil society. No one wants evil to spread, least of all someone running a criminal organization. For our gang of thieves to be successful, they must be vigilant against the leakage of behaviors. If the trustworthy behavior within the gang were to leak into how they deal with the outside world, their heisting days would be over. And if the non-trustworthy behavior outside of the gang were to leak into the gang, the gang would explode. The very ability of good and evil to spread memetically tends to undermine the existence of the criminal enterprise. Not so for the farmer’s co-op. If their goodness spreads memetically, that’s only good for them. They don’t need to worry about the leakage of behaviors, because all of their behaviors are self-reinforcing. Any “leakage” or imitation of them just makes them stronger. Based only on our basic definition of good and evil, I think something becomes clear. Over time, evil systems will tend to dissolve, as they undermine their own existence. Over time, good systems will tend to grow, as they affirm their own existence and the existence of their surroundings. And that’s why I think that good wins. My favorite theory of atonement is Peter Abelard's moral influence theory. Or, in our time, perhaps (as Micah puts it) "memetic atonement theory." Nicely done. Hi Micah, I think your "Minimum Viable Theology" is a great idea. Less is really more. If you keep this series short, clear, and simple, you will achieve something.